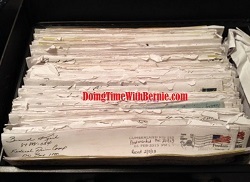 DoingTimeWithBernie.com: Hey Megyn Kelly, Felon Bernard Kerik is a conman, corrupt cop and criminal! Hey Megyn Kelly, Felon Bernard Kerik is a conman, corrupt cop and criminal! Hey Megyn Kelly, Felon Bernard Kerik is a conman, corrupt cop and criminal! So why do you participate in his masquerade as a trusted terrorism expert? Megyn Kelly, The Kelly File and Fox News recruited felon on supervised release Bernard Kerik to sit on a panel in "Kelly File" special "Terror in America". We all must wonder what a felon on supervised release could add to this conversation? Does eight-time convicted felon, corrupt cop and criminal, Bernard Kerik have intelligence briefings with the NYPD or the US government to whom he reportedly owes over $500,000 in criminal restitution and IRS Tax Liens? We think not! Felon Bernard Kerik rescued only himself on 9/11 and reportedly made over $12 million in the aftermath of September 11, 2001 pretending to be a hero. It appears he hasn't paid his full debt to society. So where did all that money go? That would make a great "Kelly File Special", Meggy! Once again, just as in that fake, phony, fraud "feud" between knee-pad Megyn Kelly and bigot Donald Trump, it's apparently all a set-up for money and ratings. Journalism has been driven in the ditch. They all play. They all win. Integrity be damned.